Love it, if we would all take on a little wisdom from the been there and done that we would all be better people. Plus we may catch more fish. THREE OF US LEFT PSL AT 6 :15 AM AND TRAVELLED 57 MILES IN 1 HOUR AND 10 MINUTES TO FISH ON THE LADY K OUT OF LANTANA AND WE WERE JOINED THERE BY THOMAS PIOTROWICZ OF OUR CLUB WHOM WON THE POOL WITH A KING MACKEREL. OUR LAST OUTING FROM PIRATES COVE WAS INDEED A RUDE HAPPENING AND THIS HEAD BOAT WAS 100% IN THE OTHER DIRECTION. Awesome! 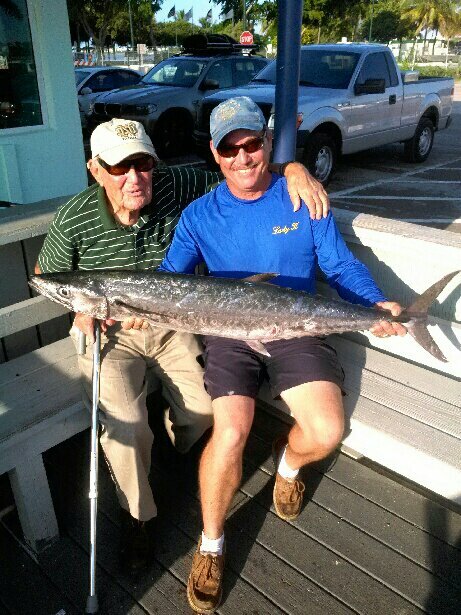 That’s my Grandpa never quits fishing.